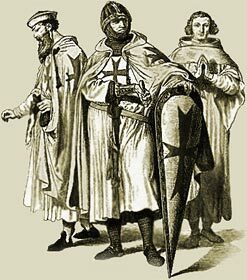 Medieval Feudalism was based on the exchange of land for military service. King William the Conqueror used the concept of feudalism to reward his Norman supporters, or vassals, for their help in the conquest of England. The land belonging to the English was taken and given to Norman Knights and Nobles. A vassal would swear allegiance and pay homage to his lord in a commendation ceremony. The commendation ceremony was designed to create a lasting bond between a vassal and his lord. Fealty and homage are a key element of feudalism. The ceremony consisted of swearing the Knights Oath of Fealty and the act of homage. "I promise on my faith that I will in the future be faithful to the lord, never cause him harm and will observe my homage to him completely against all persons in good faith and without deceit." The Knights Oath of Fealty was sworn during a solemn ceremony necessitating an act of homage. The vassal would appear before the lord bareheaded and without and weapons. The vassal would then kneel before the lord, clasping his hands as in prayer which he would stretch outward towards his lord. This position signified total submission. The vassal then swore the Knights Oath of Fealty. The lord would then take the hands of the vassal and announce his acceptance. The Medieval Times website provides interesting facts, history and information about these great people and important historical events which scatter the Medieval History books including Knights Oath of Fealty. The Medieval Times Sitemap provides full details of all of the information and facts about the fascinating subject of the lives of the people who lived during the historical period of the Middle Ages. The content of this article on Medieval life and times provides free educational details, facts and information for reference and research for schools, colleges and homework for history courses and history coursework.